Dirty rice is usually associated with Cajun food. But, I always like to put my spin on things. 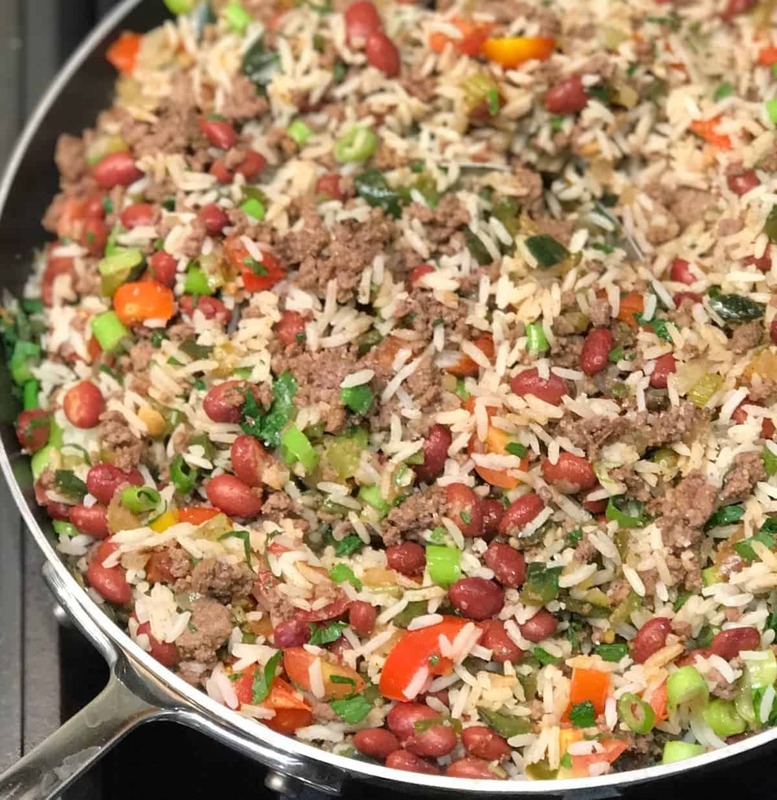 I wanted to show you how to make this version of Puerto Rican Rice and Beans. I like rice. Not only is rice comfort food, but it’s also a staple in my two favorite food categories; Asian food and Hispanic food. This version of Dirty Rice is a little bit spicy and has a ton of flavor. 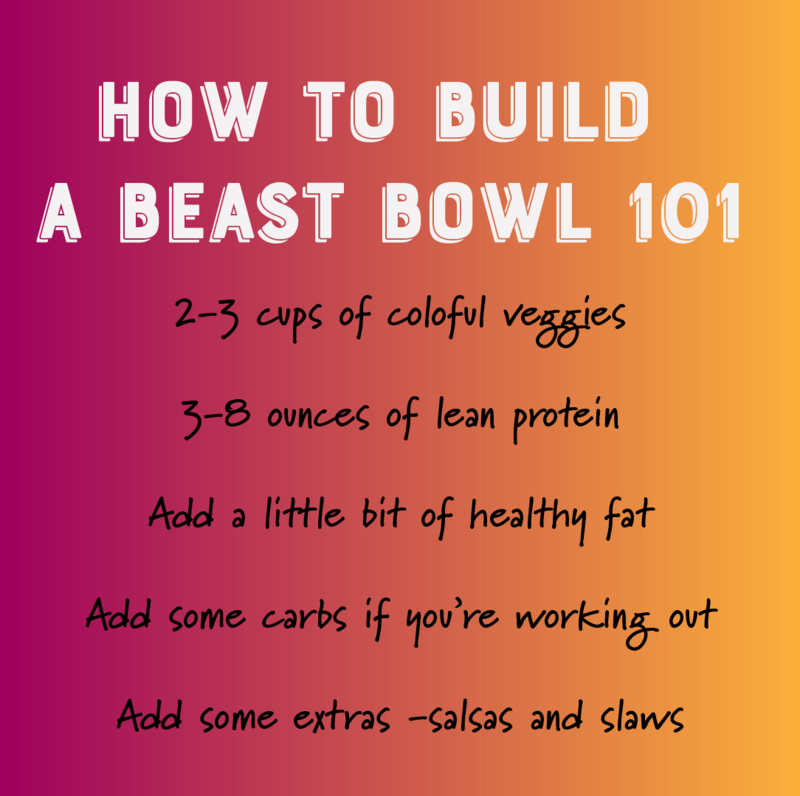 It has a substantial amount of veggies, plus protein from the meat and even more from the beans. Have some leftover rice? Some leftover meat? It sounds like the perfect time to make some easy rice and beans. Dirty rice is easy to make and great when you have leftovers. Add some vegetables and few spices, and you can make an awesome bowl of yumminess that stores well, reheats like a champ and is super portable. One thing that I cook up most weeks is a batch of grass-fed ground beef with onions. I usually just salt and pepper it, then I can use it during the week to get in some extra protein by adding it to a bowl of veggies or making a quick soup. It’s so easy to measure out for your weekly meal prep. Or when you have a batch of pre-cooked meat in the fridge or freezer, it is easy to whip up a dish like this. For my work lunches, I like to pack a quarter of a baked sweet potato and raw broccoli in my reusable food prep containers. Then, when I reheat everything, the broccoli cooks just enough, and I have a quick well-balanced lunch. On my heavy lifting days, I pack in some rice to get a little extra carbs. If I have leftover rice, then I can throw together something like this easy Puerto Rican rice recipe. Since the rice is already cooked and the meat is already cooked, it comes together in no time. Fried rice is the Perfect Way to Use leftover vegetables. When I was thinking about how to make Puerto Rican rice, I just happened to have some leftover poblano peppers from my Chili Verde Recipe that I had made the week before. (You should definitely take a look at this recipe too!) I’m a master at repurposing ingredients. I have a no leftovers left behind policy. There are a million different way to use leftover ground beef. Which is exactly why I brown up a double batch when I am figuring what to meal prep for the week. I don’t like to waste food, so I am always thinking of creative ways to use leftover ingredients. It’s honestly how a lot of my recipes are born. Cooking as much as I do, I always have a random assortment of vegetables or other leftovers. I like the challenge of turning them into something palatable. Sometimes it’s excellent, like this fried rice recipe and other times it is a complete disaster. Although I have to say, that doesn’t happen too often. On this particular week, as I looked at some of the stuff in my fridge, this spicy rice and bean dish came to mind. So, I decided to put my twist on it and voila! Puerto Rican Dirty Rice was born. It’s as easy as sautéing all the veggies in a large skillet. Then, add the rest of the ingredients and toss it together, and heat until warmed. One of my best friends is a five-foot-nothing, spicy, Puerto Rican badass. She’s made her version of this dirty rice and brought it to a few of our work get-togethers. Hers is a little different, and I’m not exactly sure how she makes it. Hers is Puerto Rican for real. Mine is Puerto Rican Chic, but it’s damn delicious. This recipe is as easy as adding all the ingredients to a skillet and then mixing and heating. Here are some more comfort food recipes from the archives. Pineapple Sweet Roll – Yep they are real!